In 2008 Avocados Australia developed a program to regularly survey avocado retail quality to measure what proportion of fruit within the retail sector meets consumers quality expectations (as determined through consumer sensory research in 2007). The program identified the main internal defects being bruising and rots (body rots and stem end rot). Quality surveys were conducted in Sydney, Brisbane, Melbourne and Perth. In each city, 16 stores were surveyed monthly. Ten pieces of fruit were sampled from each store, depending on the availability of ripe fruit (including both Hass and Shepard when available). The overall damage and the proportions attributed to any defects seen was recorded for every fruit sampled. 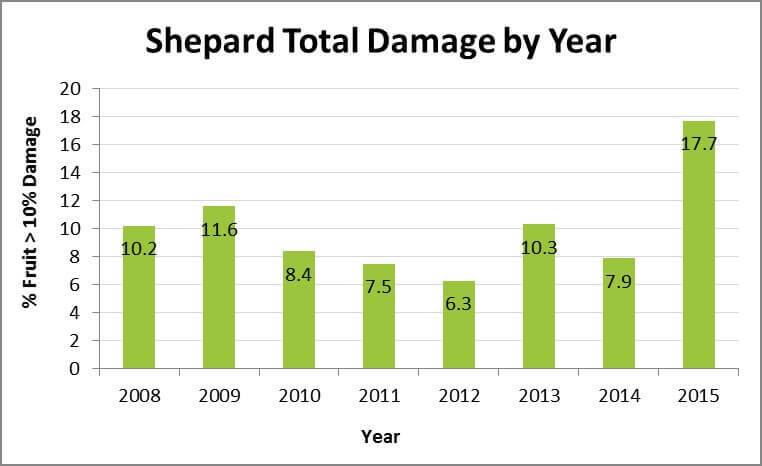 Results show overall internal quality in both Hass and Shepard improved since the program began in 2008. 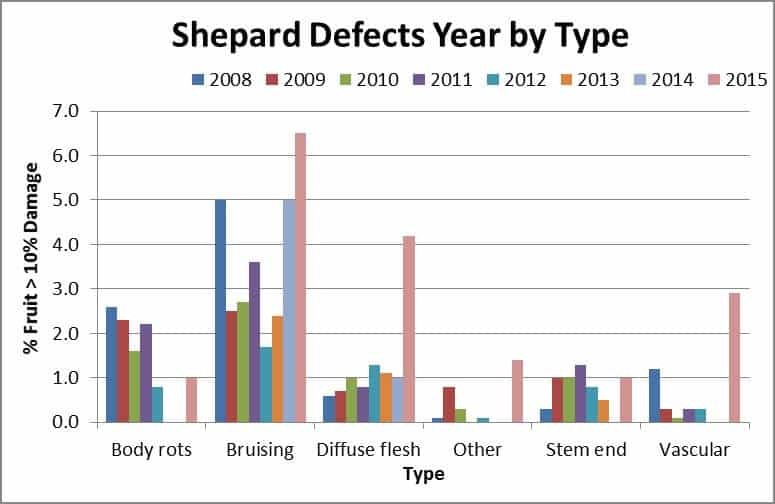 However, incidences of internal defects varied significantly by sampling month, state, and store type. Figures 1 and 2 below show the proportion of fruit sampled that had more than 10% internal damage to the flesh for Hass and Shepard. 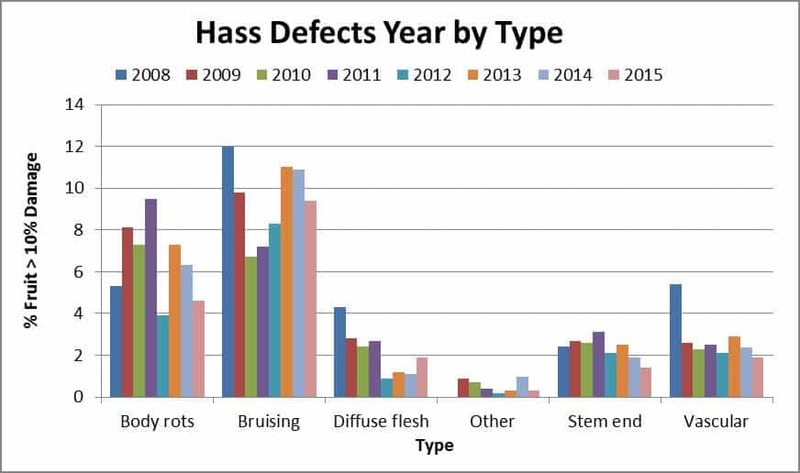 Figure 3 shows the levels of the main defects of Hass avocados observed over the eight years. Rots and bruising have continued to be the most common defects. In Shepard avocados, the damage recorded is much less but again bruising remains the most significant issue followed by rots (Figure 4). In terms of Hass damage by store type, the data has been summarised into four store type groupings; Major Supermarket 1 (M1), Major Supermarket 2 (M2), Independent Supermarkets (IS) and Independent Fruit and Vegetable Stores (I). 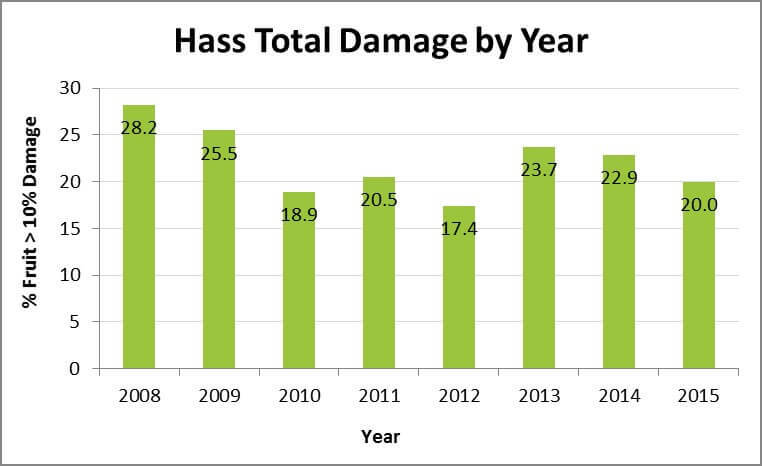 While retail outlets have improved Hass quality overall since 2008, there are significant differences in the levels of bruising of Hass by store type (Figure 5). Lower bruising damage in independent stores has been observed over the course of the project. 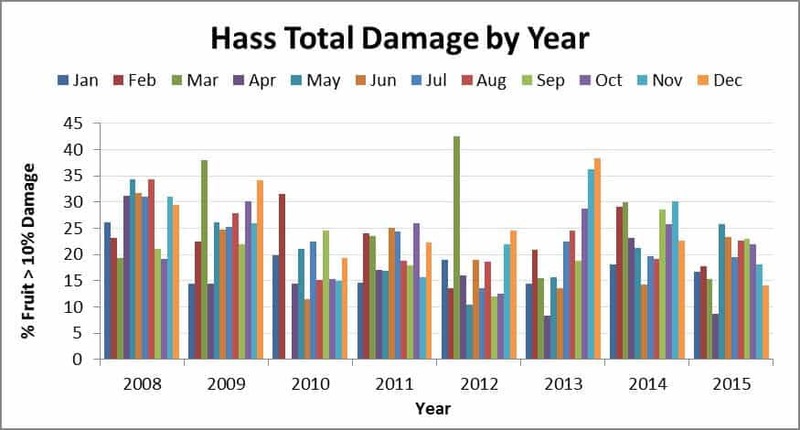 An analysis of Hass damage across the year illustrates the monthly variation. (Figure 6). Full details of the data collected over the eight years are included in the final report AV11015, available on the Best Practice Resource. This data was collected as part of Project AV11015 funded by Horticulture Innovation Australia using the avocado industry levy and funds from the Australian Government.